Felt : Edinburgh Imports, Inc., Your source for teddy bear making supplies & 100% Schulte® German Mohair. 1mm Felt from 100% Merino Wool by the yard or 9" x 11" pieces. 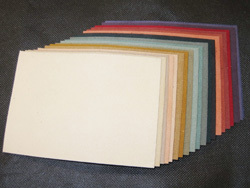 Assorted colors pre-pack grab bag felt pieces. Size 6 pieces @ varying sizes approximate 4"x4" to 4"x8". Piece size is 9" x 11" 100% Wool Felt made in Holland. Piece Size 9"x11" A mixed brown colored felt. Very natural look. 100% wool felt made in Holland. Piece Size 9"x11" Mixed shades of wool felt to made this dark medium brown. 100% wool felt made in Holland. Piece Size 9"x11" This is different shades of light grey to make this mixed felt. 100% wool felt made in Holland.